I'm trying to delete gluten from my diet as much as possible because of inflammation issues I seem to be having as a result of eating wheat products. 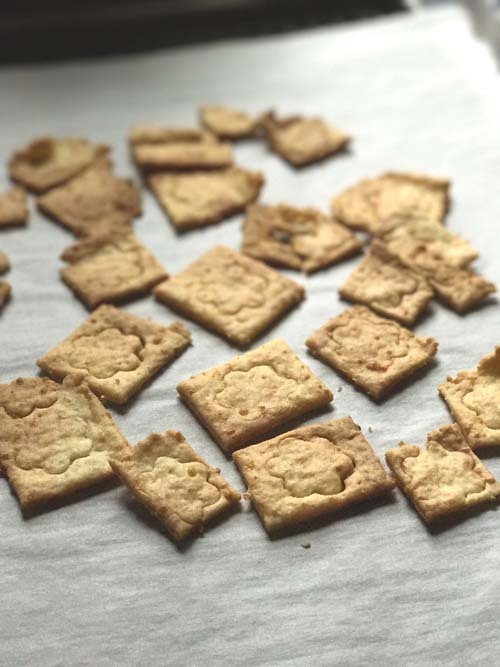 I love crackers--all kinds--and today I finally took the time to make some gluten free cheese crackers. I'm glad I did. I looked at several recipes, and decided to go with one of my favorite recipe sources: King Arthur Flour. They never let me down, even if I am trying to give up most of their products. 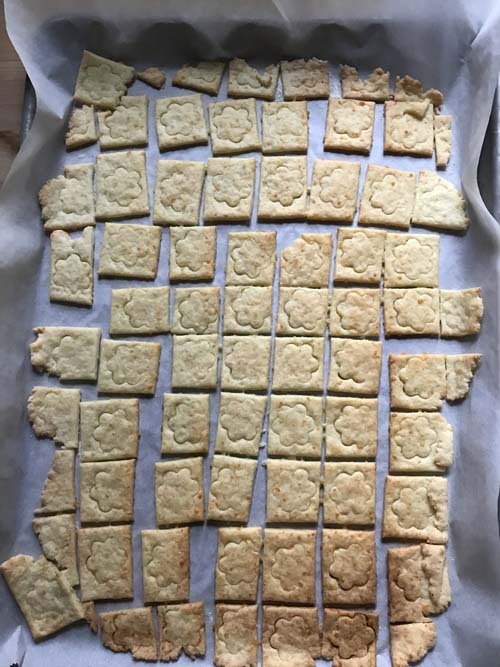 The original recipe called for 8 tablespoons of butter, but with the cheese I thought that would be too much butter and result in greasy crackers. I do enjoy greasy crackers sometimes, but knew I didn't want to make that today. So I cut the butter in half, and the crackers turned out fabulous anyway. 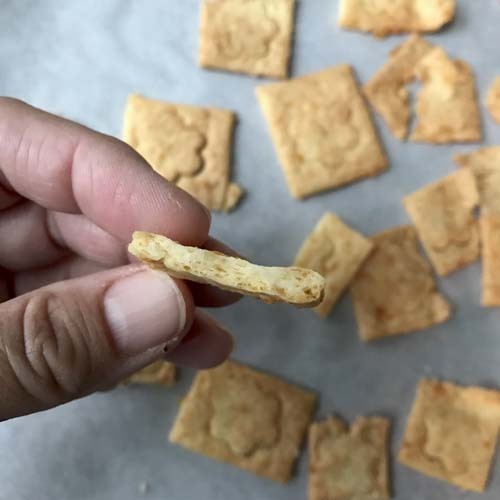 They have great flavor and crispness, and I think they sort of taste like Goldfish Crackers. My boys think they taste like Cheese-Its. Either way, they're a success. I strongly recommend you use a sharp cheddar, as opposed to medium or mild, and you'll get a better cheesy taste from these. Preheat oven to 400 degrees Fahrenheit. Gather two baking sheets. 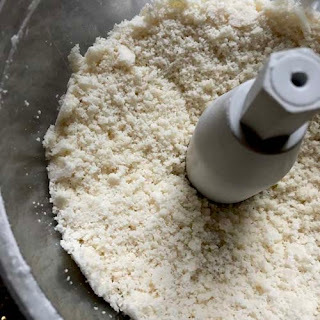 Place the dry ingredients in a food processor and pulse a couple of times to combine. Add the butter and process until butter is incorporated. Add the cheese and process until mixture looks like cornmeal. In a small bowl or glass measuring cup, whisk the egg and vinegar until frothy. Add the water to the egg & vinegar, and mix. Add the wet ingredients all at once to the dry ingredients. Process until you have a cohesive dough. If it seems very dry, add a teaspoon of water at a time until it is cohesive. 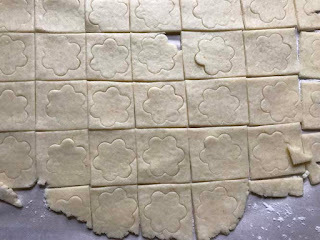 Place a sheet of parchment on a flat surface, sprinkle with some flour. 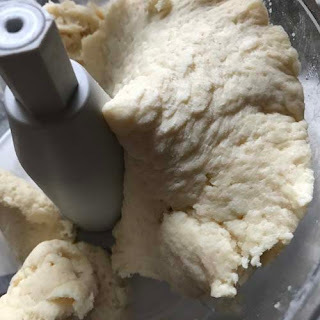 Divide dough in half; set one half aside. Try to form the dough into a rectangle and flatten slightly with an open hand. Sprinkle with a little flour and top with a piece of plastic wrap. Remove plastic wrap and then using a pizza cutter, cut dough into 1 to 1 1/2 inch squares. 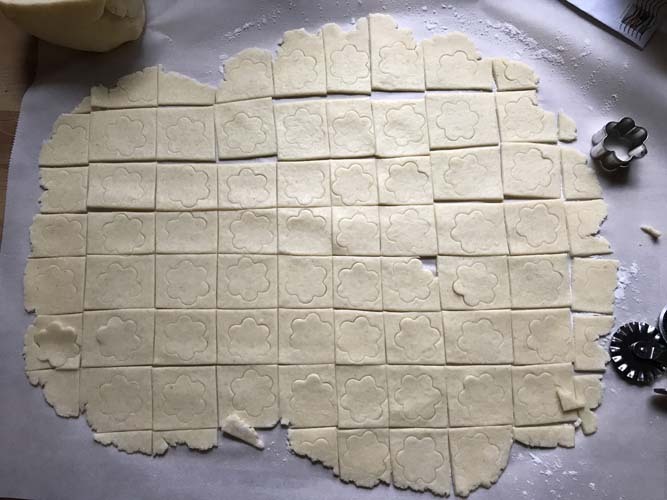 Either pierce squares with a fork, or make a slight imprint with a very small cookie cutter. 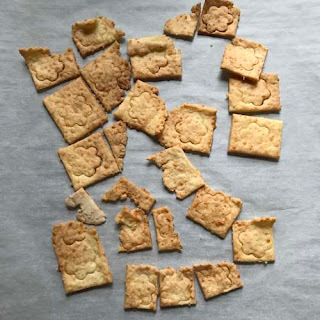 Slide parchment sheet with unbaked crackers onto a baking sheet, and try to separate pieces a bit if you can. Bake at 400 degrees for 12 to 16 minutes, rotating pans halfway through. Remove from oven and remove the ones that are done on the edges. Spread remaining crackers evenly over their pans and place back in the oven to bake until browned to your liking, about 3-5 more minutes probably. Keep an eye on them. 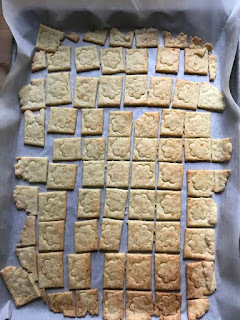 When crackers are all baked, cool completely on the pans or a wire rack. When completely cooled, move to an airtight container or zip top bags to store. Makes quite a few crackers. 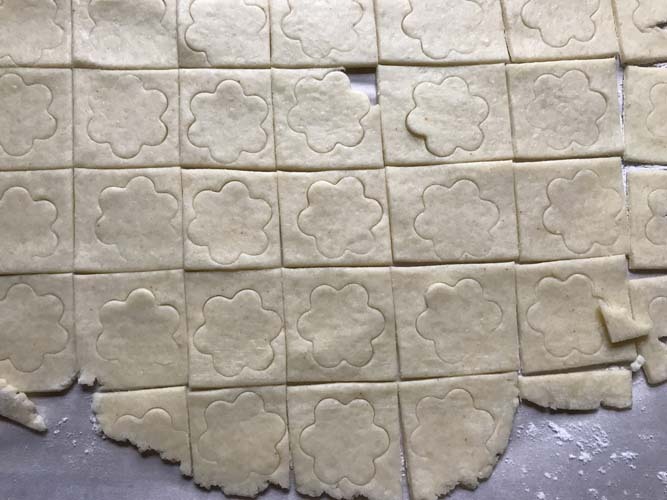 Dough has been rolled, cut, and semi pierced with that little cookie cutter. I removed the dark ones from the bottom after 13 minutes in the oven. Then I baked the rest for 4 more minutes. Hey! It looks like a cracker inside there!